Word has been received of the February 4 death of Sherwood Durkee, former Grace Brethren pastor and administrator at Grace Village in Winona Lake, Ind. His obituary appears below. Rev. Sherwood V. Durkee, 88, finished his journey and went home to be with the Lord on February 4, 2014 in Winston-Salem, North Carolina. Sherwood was born in Brighton, Michigan on July 14, 1925. He was the son of Raymond and Cora Ethel Durkee. After receiving his call to ministry, Sherwood left the farm with his wife, Joyce, and their three daughters. He attended Grace College and Grace Theological Seminary in Winona Lake, Indiana. 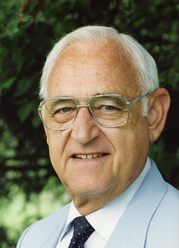 Sherwood served as pastor of the Grace Brethren Church in Vandalia, Ohio, as well as South Bend, Indiana and Johnson City, Tennessee. He finished his career as the administrator of Grace Village in Winona Lake, Indiana. Sherwood is survived by: his wife of 67 years, Joyce; his children Kay and Linn Shorb, Kathy and Mike Parcell, Mark and Karen Durkee, Kris Durkee and Donna Hall; four grandchildren; and four great grandchildren. Sherwood and Joyce attended Unaka Avenue Baptist Church and ask that donations, in lieu of flowers, be sent to the church at 1213 E. Unaka Avenue, Johnson City, TN 37601. The family of Sherwood Durkee will receive friends from 1:30 to 2:30 PM Saturday February 8, 2014, at Morris-Baker Funeral Home. The interment will be at Happy Valley Memorial Park and is private.